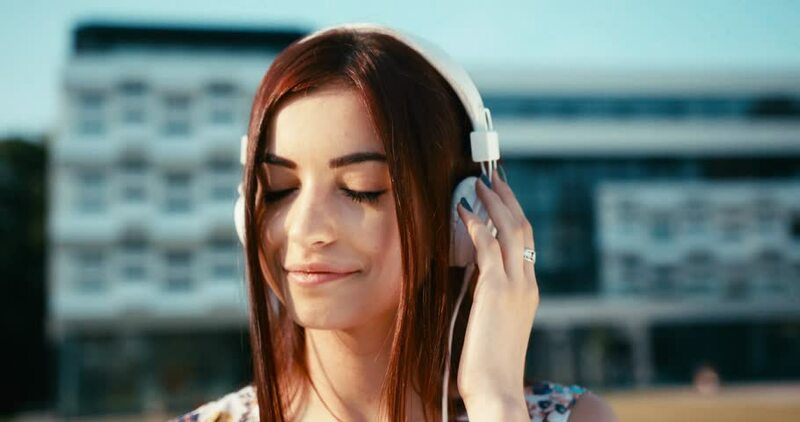 Portrait of the beautiful young brunette with charming smile enjoying music in headphones. 4k footage. hd00:20Young beautiful woman listening to music on headphones against background of green summer city park. hd00:29Young blonde woman in blue dress, smiling and dancing while wearing headphones connected to a cellphone playing music. Close up. Originally recorded in 4K, UHD. hd00:09Beautiful young girl listening to music on headphones. The girl in the park . 4k00:18Beautiful young woman relax listening music on city street. 4k00:10Beautiful loving couple of hipsters are laughing while watching video on the mobile phone in the sunlits. Flare light. 4k. 4k00:21Emotional portrait of the cheerful attractive young brunette dancing while listening to music in headphones outdoor. 4k footage. 4k00:12Young charming girl with pretty smile is having fun in the shopping cart. The handsome guy is pushing the trolley. 4k. 4k00:16Portrait of the charming happy loving couple using mobile phone while sitting on the bench. 4k. 4k00:13Portrait of the young couple of hipsters are laughing while watching vieo on the mobile phone. Flare light. 4k. 4k00:28Attractive young brunette with charming smile is browsing and texting via the mobile phone. Up close-up portrait. 4k footage. 4k00:13Beautiful positive brunette with charming smile is walking and spinning round in the parking lot. 4k footage. 4k00:09Positive wonderful girl with red hair and perfect smile is looking at camera. Moving hair from wind. 4k. Close-up portrait.